Suppose that there are two currencies INR(domestic) and USD(foreign). Let the for exchange rate be S_inr. Using historical data, one can find out the volatility. 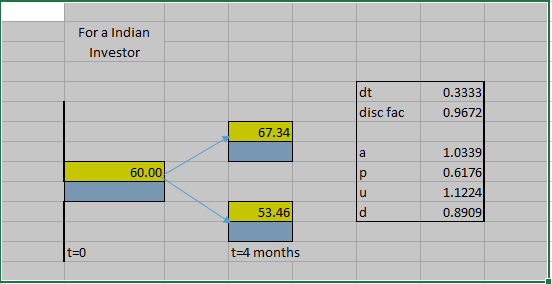 For example, assume that, S_inr=60,σ=0.2,T=1,r_inr=0.1,r_usd=0 (the usual notation); I constructed the tree and found out Risk Neutral probability(RN1). 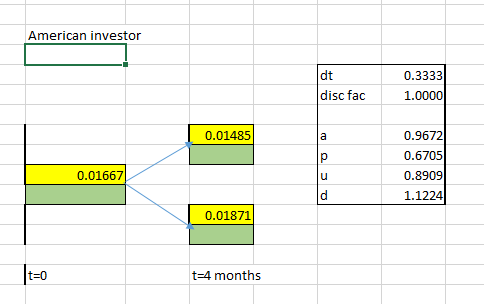 I also constructed the tree from an American investor perspective and found out the Risk Neutral probability(RN2). RN1 and RN2 are not the same. I understand that it gives mathematically inconsistent trees when we use the same risk-neutral probability "p" for an American Investor and for an Indian Investor. However, I fail to comprehend the following: Why is that the risk neutral(RN) probabilities change depending on whether we consider an Indian or an American perspective? RN probability is simply the probability, as anticipated by a Risk Neutral investor, on whether the exchange rate moves in a certain way. In other words, it is the probability expected by an RN investor that the currency appreciates or depreciates. So, it should not matter whether we consider USD to INR or INR to USD. I am sure that there is something I am missing. The explanation that works for me is that what constitutes risk for a US investor (i.e. Making or losing money measured in dollars) is different from what constitutes risk for an Indian investor ( i.e. Making or losing money measured in INR). Hence there is no paradox. Actually, I ran the model with higher number of time periods and RN probabilities from both, USD and INR, perspectives seem to converge to the real RN probability associated with a lognormal model. So, the apparent paradox is because binomial approximation to Lognormal model works only when the duration of each time period is very small(or high number of time periods. When we use fewer number of time periods, the binomial model is at most a good approximation. So, the approximations are bound to differ from the real RN probability when viewed from INR or USD perspectives. Thanks everyone for trying it out and helping me. For others, just an update: Here is the mathematics behind the convergence of RN probability when you increase the number of time periods. The final value remains the same whether you approach from USD or INR perspective. The same can be repeated and verified from USD perspective. Not the answer you're looking for? Browse other questions tagged risk-neutral-measure binomial-tree or ask your own question.